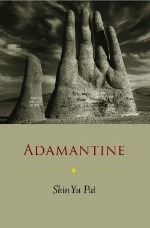 Adamantine, as the title reflects, is a collection filled with luster, gleaming with deep insight, and further characterized by an ethereal landscape, focused on emotional connections, on spirituality, on death, and on the afterlife. Pai’s work travels both within and outside of ethnic and racial frames, thus complicating any transparent categorization of the collection as “Asian American” literature. The homonyms of “eye” and “I” function in different contexts, both on the level of ‘one who watches’ and ‘one who speaks.’ The following lines accordingly consider the issue of witnessing, with respect to the plight of global poverty. What is the responsibility of the lyric speaker, Adamantine continually asks, with respect to voice and sight? In that vein, I’d like to concentrate on one of the overall lyric approaches that Pai takes, which is to place current events and historical figures in comparative perspective. As part of Pai’s relational approach, the collection opens fittingly with an epigraph from Michael Ondaatje’s novel Anil’s Ghost. The passage from which Pai excerpts refers to prayers and mantras and explores how such spiritual inscriptions speak to individual loss and to aesthetic beauty. At the same time, by invoking Anil’s Ghost, Pai sets Adamantine firmly within a tradition that queries human rights and global conflict. Perhaps we are not surprised, then, when we find that the first poem’s title is “This is not My Story,” as if to immediately query the autobiographical impulse of the confessional lyric. The lyric stories of “Adamantine” are often those of Asian or Asian American figures who move beyond the speaker, including Thich Quang Duc in “Burning Monk,” where the lyric speaker repeats, as a kind of mantra, “his heart refusing to burn / his heart refusing to burn / his heart refusing to burn” (19). Of course, Thich Quang Duc is most famously known for his self-immolation in protest of the Vietnam War. The use of the word “heart” arcs out across this collection. We are reminded in the very first poem, “This is not my Story,” that the “human heart is / a wholly different animal, / we must sense when to give in / before the other gives up” (11). The importance of emotion and affect imbues the lyric speaker with a kind of power, leading her toward a pathway that involves spiritual reawakening. Another figure invoked is James Kim, the Korean American who died tragically when he and his family were caught in a winter snowstorm in Oregon. The lyric speaker gestures again to loss, but contextualizes his death within the frame of sacrifice, as James had attempted to situate help for his family despite the possibility that he could have succumbed to the austere weather conditions.